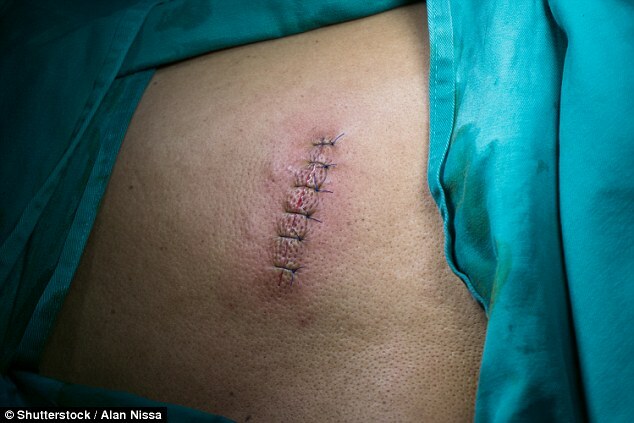 For most patients, getting stitches to close a wound is like adding insult to injury. But scientists have revealed a new bandage made of tiny pieces of gold intertwined in silk that could one day replace them. And studies on pig intestines and mice have shown it actually heals wounds just as well as having a painful row of stitches. The bandage, activated with the heat from a laser shone onto it, can also withstand seven times more pressure before it bursts. Arizona State University researchers were behind the invention, which is a thin strip that is placed over a patient’s wound. It does not require the skin to be pierced, unlike stitches, and can be pulled off like a normal bandage once the cut is healed. Gold nanorods – about 10,000 times thinner than a human hair – inside the bandage convert the light of the laser into heat. Dr Kaushal Rege and colleague say the heat causes structural changes in the molecules of the silk and human tissue. NewScientist reports that this process allows the silk to bond to the tissue like Velcro, causing the wound to heal over time. In the first trial of the bandage on animal tissue, the researchers tested it on intestines from dead pigs in the laboratory. The study showed the laser activated silk and gold nanorods withstood seven times more fluid pressure before bursting than stitches. Writing in the journal it was published in, Dr Kege and team said the strength of the bandage was ‘similar to that of the intact intestine’. A second experiment was conducted on live mice. Scientists purposely cut the skin of the rodents to test the bandage. After just two days, the laser-sealed skin was stronger than the skin of mice who had sutures or it glued back together. And the rodents treated with the new bandage reported less inflammation. The findings were published in the journal Advanced Functional Materials. And the researchers want to test the laser-activated nanosealants on larger animals with skin similar to that of humans. Dr Kege warned the jury is still out on gold nanoparticles, and studies are needed to determine if they could pose harm in the long-term.